Some of Mesquite's red-light cameras that were taken down are going back up along a major interstate. The City Council is going forward with a plan to increase the number of red-light cameras along Interstate 635. Three red-light cameras will be installed at I-635 and both directions of Oates Drive and I-635 and Town East Boulevard. The locations were selected based on a study. Mesquite city spokesman Wayne Larson said the move is "all about public safety." Ashley Lovegren said she sees drivers running red lights when she is at the intersection of Town East Boulevard and I-635. "People run red lights all the time," she said. "It's very congested. It's very crazy -- people don't pay attention, slamming on their breaks." 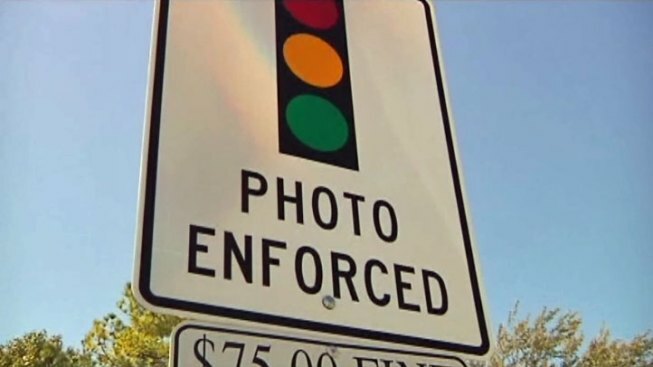 In February, the city took down red-light cameras at three intersections because they didn't see improvements in the number of crashes involving red-light runners. But they said they hope the new cameras will send a clear warning. "We feel confident that having these new locations set up with red lights will help us reduce and hopefully eliminate right angle collisions," Larson said. In the study, the intersection at Town East Boulevard and I-635 had the most violations -- 67 in a 12-hour trial period. "I have mixed emotions on red-light cameras," said Stuart Scantlin, a Rowlett resident who frequents the area. "I think they can (have) as many wrecks as they prevent so I'm not really big on the red-light cameras." It cost the city $37,000 to run the program last year, and more than 5,000 people received red-light violations. The city expects the cameras to be installed at the three new locations on Jan. 1. The Texas Department of Transportation must also sign off on the plan to put cameras along I-635.